These aren't the layouts I promised with the first day of summer vacation pictures but I did these over the last couple of weekends. 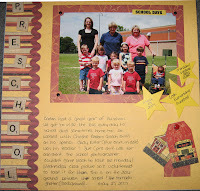 This first one is of Caden's preschool class this year. The school photographer took all the class pictures on a Tuesday but wouldn't come back to take the pictures for the Monday/Wednesday classes. I took one for them so the parents would have it. All the supplies came from a Personnal Shopper Kit from Hot of the Press (Paper Wishes). The tiles are Scrabble tiles from EK Success. 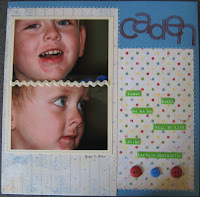 I also used the Ticket Corner Punch from Stampin' Up! and a black journaling pen (not sure which one I used...I have about 5 or 6 of them). But everything else is from the kit. This layout is done with Crop Addict's Guest Designer Team Contest kit. Can you tell I like kits? It used papers from Daisy D's and the buttons are from American Crafts. The solid cardstock (vanilla and blue) are from Bazzill. I'm not sure where the ric rac came from but was included with the kit. The rest was from my own stash. I used a black journaling pen and did the dots around the picture mat. I used the paper piercer from Stampin' Up! 's Crafter's Tool Kit and did the stitching holes around the patterned paper and connected the dots with a white gel pen (uni-ball). The letter stamps are Big Deal Alphabet (SU!) and Cranberry Crisp Classic Ink (SU!). I used Around the Block's label maker for my journaling strips. Also, for those of you who like sketches, this sketch idea came from Creating Keepsakes Easy Patterns for Scrapbooking by Brenda Arnall. That's a fun book especially when you are in a hurry for a layout or are in a slump or just can't think anymore! I hope to get those other layouts done soon. Today is my birthday so I'm giving myself the day off and I hope to get to scrapbook or make cards all day long. My sweet hubby is taking the family out to dinner and then taking me to Michaels or Hobby Lobby so I can pick out some more scrapbooking supplies...YIPPEEE!! !